Concerts Penzance new season started with a truly exceptional performance by the Busch Trio in October - a reminder that this series provides top international quality chamber music performances in the centre of Penzance. On Saturday 14th November the Sacconi String Quartet make an overdue return visit to Penwith after an absence of several years, performing at 7.30pm at St. Mary's Church, Chapel Street, Penzance. In the years since they first visited St. Ives for their Music in May festival, the quartet have become firmly established as one of the leading quartets of their generation. 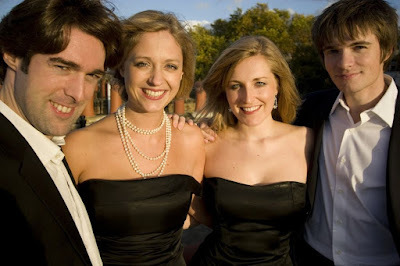 The quartet enjoy a highly successful international career, performing regularly throughout Europe, at London's major venues, in recordings and on radio broadcasts. In Penzance the Sacconi Quartet perform the first of Haydn's most mature set of quartets alongside two shorter works String and Servant composed by St. Buryan based composer Graham Fitkin - the Sacconi's CD of Graham Fitkin's quartets is set for release in 2016. In the second part of the concert the quartet are joined by viola player Tim Boulton and cellist Danny Jones to perform Brahm's wonderfully luxurious B flat major string sextet. Tickets cost £11 (£2 for under 19s) in advance from Mounts Bay Wine, Bread Street, Penzance or £12 (£2) on the door.